Today we were visited by Wayne Falk, the Vice President of Sales & Marketing for Hudson Valley, Corbett, Troy, Sonneman, and CSL. I've blogged quite a bit about Corbett & Troy, so today I thought I'd show our new favorite from Hudson Valley. This picture from their brand new catalog is what they call a "lifestyle shot" ~ so it shows the chandelier pictured in a room as you would use it. 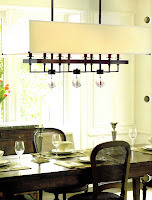 This fixture is a good example of a relatively new trend ~ the long or oval fixture hanging over a rectangular table. Several of our manufacturers now offer these long pieces, so there are many styles to choose from.